Chocolate and Love make excellent quality, ethical, organic chocolate at an affordable price. 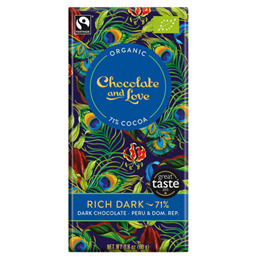 Their chocolate bars are made with fine flavour cacao beans chosen for their distinct flavour profile, which are sourced directly in Peru, The Dominican Republic and Panama. The cane sugar is sourced directly from Paraguay and Costa Rica and the vanilla directly from Madagascar. Below are reviews of Chocolate and Love Rich Organic Dark Chocolate - 80g Bar by bodykind customers. If you have tried this product we'd love to hear what you think so please leave a review. Absolutely delicious Organic/Fairtrade chocolate! Rich, smooth and dark, with a lingering licorice-like aftertaste. This and the Chocolate and Love 80% Panama bar are amongst the best chocolate we've ever tasted. It's no wonder they've won numerous awards. Will definitely be back for more!